The Victoria Cross is the highest military decoration awarded to members of the armed forces of the Commonwealth and previous British territories for acts of extreme bravery carried out under direct enemy fire. It is first in the order of wear in the United Kingdom’s honours system and may be awarded to a person of any military rank in any service and to civilians under military command. The VC is usually presented to the recipient or to their next of kin by the British monarch at an investiture held at Buckingham Palace. Introduced in 1856 by Queen Victoria the medal has been awarded 1,358 times to 1,355 individual recipients. Nine holders of the award are buried within Egyptian Commonwealth War Grave Cemeteries of which 4 were awarded during the course of the Great War. Regiment/Service: Bedfordshire Regiment, 1st/5th Bn. There are two versions of his VC citation – both explain the action, but the wording is different in places. An extract from The London Gazette, No. 30982, dated 29th Oct., 1918, records the following:-”For most conspicuous bravery and initiative when with a strong patrol which was heavily attacked by the enemy and forced back in confusion. At this critical moment, Pte. Needham ran back and fired rapidly at a body of the enemy at point-blank range. His action checked the enemy and enabled the patrol commander to reorganise his men. The patrol had many casualties, but successfully got back all their wounded, and it was due to the action of individuals, of which this is the most outstanding, that the entire patrol was not cut off. He was killed by an accidental gunshot wound at Kantara, Egypt on 4 November 1918. 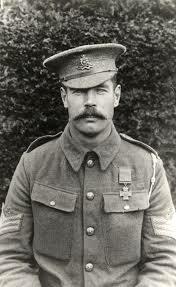 His Victoria Cross is displayed at the Bedfordshire and Hertfordshire Regimental Collection at the Wardown Park Museum, Bedfordshire. Family memories recount that Horlock was called the soldier who ‘defied the doc’. Twice, Horlock was ordered to the army hospital by doctors for treatment, but he chose to ignore these orders and returned to his gun. He remained with his gun until it was finally blown up, and he was carried away from the scene. Ten of his comrades had been killed in the action. On the third occasion that Ernest George Horlock was injured, it is reported that he again refused to see a doctor because he was ‘scared of getting a rocket’ for having disobeyed doctors’ orders and continued to fight. 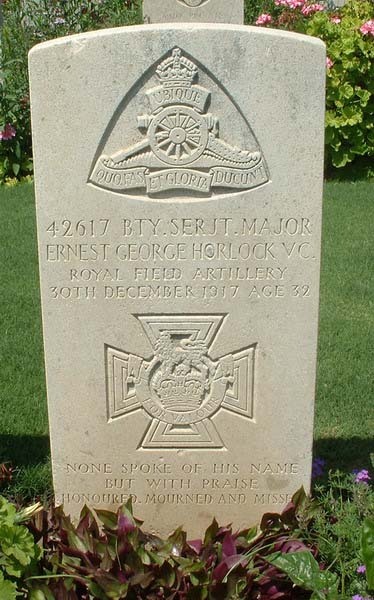 In November 1916 Horlock was promoted to Battery Sergeant Major and subsequently posted to Egypt. Sadly on 30th December 1917, just two months after his marriage to Ethel Halsted he was torpedoed whilst on the troop ship SS Aragon voyaging from Marseille to Alexandria. 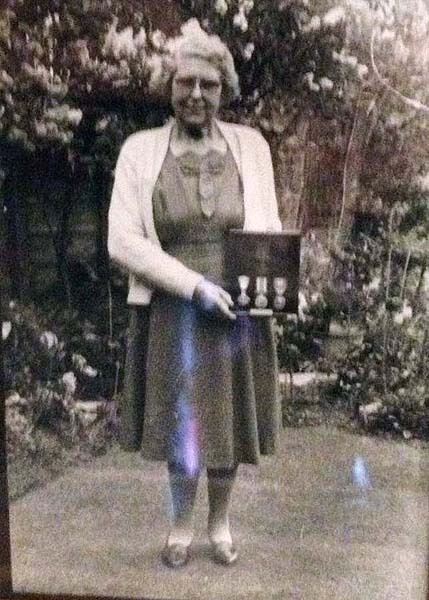 He survived the sinking, but when he and other soldiers had been rescued by the escorting destroyer HMS Attack, she too was torpedoed, Horlock was one of the 600 who did not survive. Ernest was buried at Hadra War Memorial Cemetery, Alexandria and his name appears on the war memorials in the Royal Artillery Chapel, Woolwich and in St. John’s church in Langrish. On 16th November, 2014 an inscribed paving slab was added to these memorials, and blessed, identical to another recently laid at the War Memorial at Alton, the town of his birth. 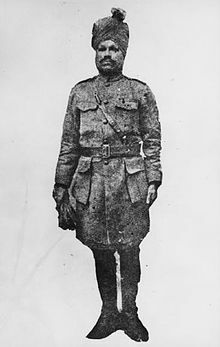 Singh, a Risaldar in the 14th Murray’s Jat Lancers performed the deed on 23 September 1918 at Khes Samariveh, Jordan River, Palestine for which he was posthumously awarded the VC. 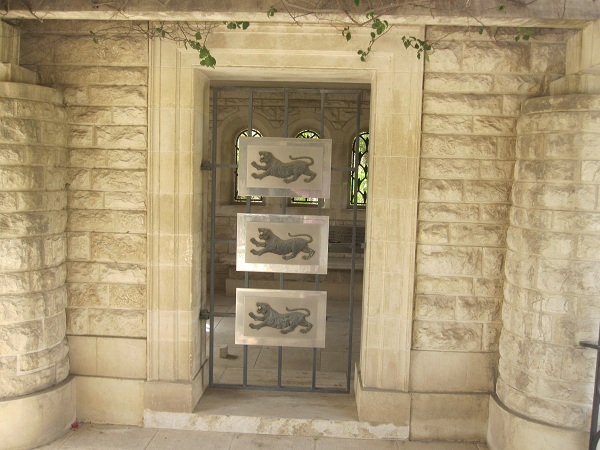 He is commemorated on the Heliopolis (Port Tewfik) Memorial in the Heliopolis War Cemetery in Cairo. Colonel Lyall is one of those few servicemen who, after being awarded the Victoria Cross in the First World War, died on active service in WWII. 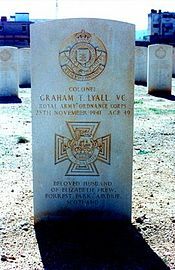 Graham Thomson Lyall was born in Manchester and following his education joined the Royal Navy to study mechanical engineering. Unfortunately he contracted an ear infection whilst swimming which led to his discharge from the Navy. Lyall then emigrated to Canada, first settling in Welland, Ontario, then moving to Chippawa, where he took up employment with the Canadian Niagra Power Company. Three days after the outbreak of war in 1914 Lyall was accepted into the 19th “Lincoln” Regiment in St. Catherine’s, Ontario, and was placed on active service. Lyall continued to serve in the 19th Regiment whilst making sixteen applications to join the Canadian Expeditionary Force, in which he was finally successful by being accepted into the 81st Battalion, CEF. The Battalion sailed for England on 16th May 1916 and on arrival was broken up to replenish Canadian Battalions decimated by fighting. 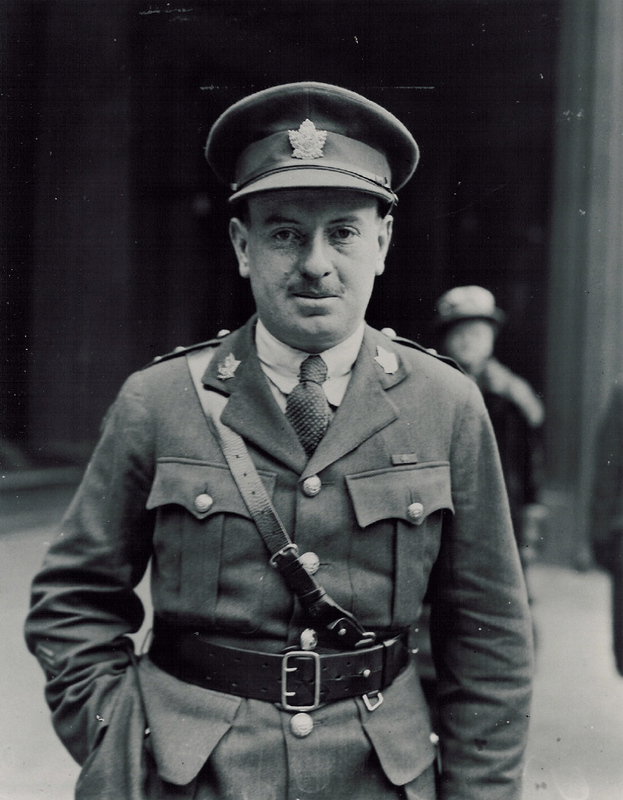 Lyall was posted to the 4th Canadian Mounted Rifles with whom he served with distinction receiving a battlefield commission for his performance following the capture of Vimy Ridge in 1917. After successfully passing-out from Officers’ Training School in England, Lyall was posted to the 102nd Canadian Infantry Battalion (North British Columbians), CEF, in France. 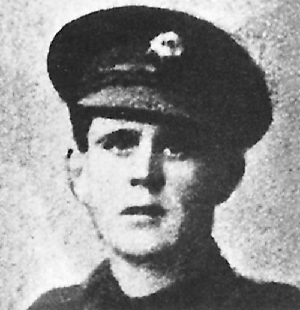 His citation in the London Gazette reads: “Whilst leading his platoon against Bourlon Wood he rendered invaluable support to the leading company which was held up by an enemy strong point, which Lyall captured by a flanking movement, together with thirteen prisoners, one field gun and four machine-guns. Later on, his platoon being much weakened by casualties, was held up by machine-guns at the southern end of Bourlon Wood. Collecting those men available, Lyall led them towards another enemy strong point and springing forward alone rushed the position single-handed killing the German officer in charge and subsequently capturing forty-five prisoners and five machine-guns. Having made good his final objective with the capture of a further forty-seven prisoners, he consolidated his position and thus protected the remainder of the company. He was invested by King George V at Buckingham Palace on the 15th of March 1919. At the outbreak of the Second World War Lyall was placed on active service and promoted to Lieutenant Colonel. On the 28th of November 1941 as a full Colonel on the General Staff in North Africa he died from heart failure during Operation Crusader in Egypt. 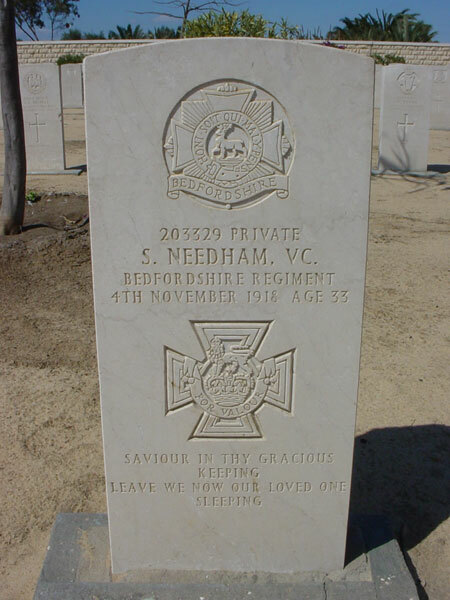 In my next post I’ll look at the remaining VC burials earned during the Western Desert campaigns of 1942.